We can never bring ourselves to pass up an offer of devouring loaded fries...And why should we deny ourselves of this cheese smothered gift? Loaded fries come in many delicious combinations but we are not one to discriminate. We love them all but there are a few that stand proudly above the rest and exemplify what it means to be truly "loaded"
This newly opened Caxton Street burger joint is serving up some of the most creative and epic loaded fries in Brisbane. The droolworthy fries are topped with Cheese Sauce, Candied Bacon, Green Onion, and Fritzensauce. I know what you're thinking...that doesn't sound that special...but you see it all boils down to one very unique ingredient that we've left out! That ingredient is Twisties Salt. Yes, the team at Fritzenberger have made Twisties into salt form which they very generously top their loaded fries with. Get ready for a mouth-gasm. The loaded fries at Getta Burger have long held a place in the hearts of Brisbanites. These fries literally have everything but the kitchen sink piled on top of them making them one of the most loaded fries in town. Smoked Brisket, Pulled Pork, Grilled Onion, Cheese, Bacon, drizzled with Mustard, Ranch and That BBQ Sauce...it's a mouthful! The loaded fries at Hello Harry's may be some of the simplest loaded fries on our list but that doesn't mean they are any less delicious. It starts with the perfectly seasoned crispy chips which are then topped with one of the most creamiest, and delicious cheese sauces we have ever eaten...that's finished off with crispy bacon and fresh green onion. Beautiful! They guys at Bella BBQ don't have do anything, and all one needs to do is see their magnificent loaded fries to know that. It's like all your loaded dreams come true. 18 hr Smoked Brisket, Pulled Pork, Candied Bacon, Mac n Cheese, BBQ Sauce, Mustard, and Cheese Sauce....stretchy pants are HIGHLY advised. Mr Burger Trucks may have only been roaming the streets of Brisbane for a month now but we are already die hard fans. I'd be lying if I said there infamous Trucker chips didn't play a role in sealing our devotion. The legendary chips are generously coated in 3 types of American cheese, crispy diced bacon, and their secret recipe Trucker Sauce. The delectable chips come in a small and large size- perfect for sharing. 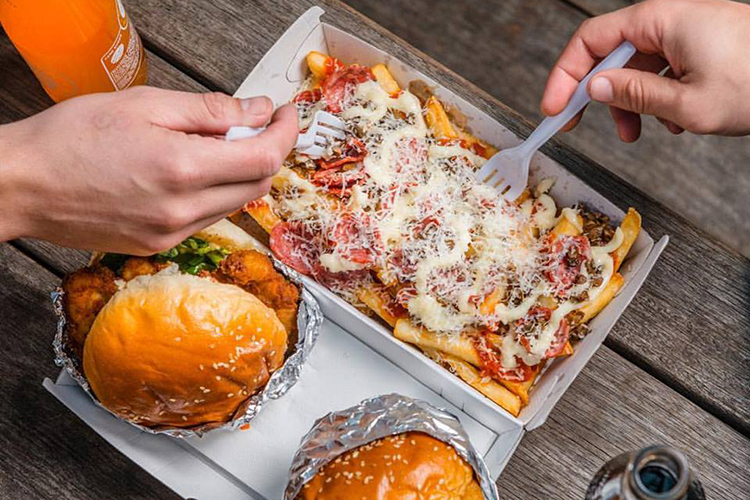 Fingers crossed they bring their loaded pizza fries to Brisbane soon! Last but certainly not least, Ze-Chips! Zepickle's famous loaded chips are topped with IPA Beer Cheese Sauce, Maple Smoked Bacon, and ZP Sauce. Now it may not have all the bell's and whistles as the other fries on our list but rest assured the IPA Beer Cheese Sauce will change your life.